I never thought I'd be a tube roller. In fact, I used to mock the practice, but here I am. I only recently found out that my R-53 wasn't shipped with the usual stock tubes (12AV7 and 12AF6). Instead, it had a 12AU7 and 12AW6. Since I bought a couple spares tubes, I decided to throw them in to see how much of a difference it makes. I was floored with the difference in putting in a 12AV7; my pulser knob suddenly had much more range, including the whole metastable area when the knob is fully-clockwise that up until then I never knew it was supposed to have! The 12AF6 on the other hand... I'm still not sure I like it better than the AW6. It's definitely nicer in some situations, but the AW6 seems to allow the pulser to sync more easily to low-level and/or smooth waveforms, as well as introducing a little instability— which is something I am sometimes finding that I miss about it. I've looked through the manual and didn't see any warnings about this, so I'm asking here: is it okay to switch out tubes without powering down my system? It'd be nice to be able to go back and forth between the AF6 and AW6 on the fly, not having to power down my system beforehand and then retune my oscillators when I power it all back up. I definitely don't want to , though. I only recently found out that my R-53 wasn't shipped with the usual stock tubes (12AV7 and 12AF6). Instead, it had a 12AU7 and 12AW6. Totally wrong. The dual triode HAS to be a 12AV7 or 5963 type. Others won't work properly. The pentode has to be a high-gain type, like 12AU6 or 12AW6. I've looked through the manual and didn't see any warnings about this, so I'm asking here: is it okay to switch out tubes without powering down my system? Yes as long as you're careful and don't short anything out on the PC board. The dual triode HAS to be a 12AV7 or 5963 type. Others won't work properly. The pentode has to be a high-gain type, like 12AU6 or 12AW6. Mine has a 5965 (left) and a 12BD6 (right) I guess that's ok too? 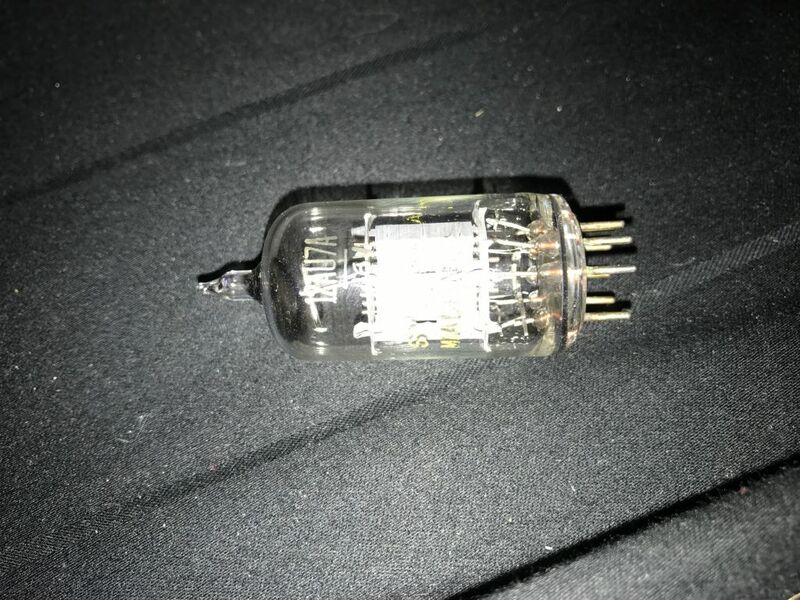 No kidding, this is the tube I pulled out of it when I put in the 12AV7. I'm thinking of just microwaving it since I really have no use for it..
As for the 12AF6: my copy of the manual, and the one on the website both mention the 12AF6 being the standard tube. "This particular R-53 was shipped, and wired for, a 12AV7 and a 12AF6. Those types are RECOMMENDED for use in the R-53, as they have the special characteristics needed by the circuit. The LEFT-hand (9 pin) socket accepts the 12AV7. Note: 12AX7, AU7, AT7 etc. will NOT work in this circuit. There are other direct substitutes for the 12AV7, such as the 5965, although 12AV7s are still very easy to obtain (as of this writing). A long list of pentodes intended for use in 12v automotive radios will work in place of the 12AF6 (RIGHT-hand socket). They include the rare types 12BL6, 12CN5, 12CX6, 12CY6, 12DK5, 12DK6, 12DT6, 12EK6, and 12EZ6. It will also accept 12AU6 or 12BA6 pentodes, these will give a lot more gain (which may cause instability)." And yet, some unnamed fucknozzle tried it anyway. And it did not work. Lolol.